Avocado For Acne - How Does It Work? Avocado For Acne – How Does It Work? Acne develops due to the abnormal secretion of oil or sebum from the sebaceous glands located in our skin. Now when this excessive secretion takes place, the oily surface at the pores of our skin attracts dirty and other matter that results in the clogging of the pores, giving rise to bacterial activity. This typically manifests in the area becoming red and swollen and rather painful. Avocado can be anti-inflammatory because it has a lot of nutrients including lauric acid which makes it anti-bacterial and antiviral. The abnormal oil secretion from our skin can be attributed to improper diet, hormonal changes, stressful conditions and even an unhygienic lifestyle. This accounts for about eighty percent of women worldwide being affected with acne at some point in their life. In this write up, we’ll look at a natural way of treating acne with avocado. The naturally occurring vitamin E not only gives avocado anti-bacterial properties but also helps in healing the skin. Avocado inhibits damage to skin cells by virtue of its ability to combat free radicals. Oleic acid, a monounsaturated fat present in avocado keeps skin healthy. Provides symptomatic relief from pain, redness and swelling. Avocado restores skin tone because of biotin present in it. Inhibits excess oil secretion from the sebaceous glands and forms a protective cover against dirt and harmful matter responsible for acne. Regular consumption of avocado helps to maintain optimum blood sugar levels thereby keeping the hormonal balance intact. We’re listing below a number of ways you can use avocado at home to get rid of acne. You can either use it alone or in combination with other ingredients. Procedure – Take one avocado and scoop out the pulp and crush it till it’s a smooth paste. Then spread this mashed pulp liberally on wherever there is acne. Leave the application to dry and then wash off with water and dry. Repeat application regularly to get results. Alternately, you can take the peel of the avocado and rub it directly on the acne for a couple of minutes. And then wash off when it dries off. Applying avocado oil has two benefits. First, it cleanses the skin pores of dirt and impurities and second, important vitamins present in it take care of acne and other skin eruptions. Procedure – Wash face with water and face cleanser and apply a liberal amount of avocado oil on acne affected area. Leave for about 25 minutes and then wipe and wash off with warm water and dry. Repeat procedure thrice weekly. Honey by itself fights bacteria, inflammation and moisturizes the skin and when combined with avocado gets rid of acne and reduces excessive oil secretion. Procedure – Mix the pulp of half avocado with one tablespoon of honey and apply on area affected after washing and drying your face. Leave the combination for about 20 minutes and then wash off warm water and dry. Repeat procedure thrice weekly for optimum results. For better results, you can add half cup of plain yogurt. The acidic nature of lemon juice cleanses the skin pores and shrinks the acne. This home remedy is ideal for acne on the back and chest. Procedure – Take a ripe avocado and mash the pulp to a smooth consistency. To this add 2 tsp of fresh lemon juice, 1 tsp of honey and 4 tsp of warm water. Mix thoroughly. Apply the mixture to the acne affected area in gentle circular motions and leave for about 20 minutes. Wash off with water, dry and apply a non oily moisturizer. Remaining paste can be refrigerated but should be applied within 7 days. This combination not only moisturizes the skin by their inherent moisturizing properties but also helps in cleansing the skin pores of dirt and impurities. Procedure – Mix 1 tbs of oatmeal to previously mashed one quarter of avocado thoroughly. Apply the mixture on the acne affected area by gently massaging in circular motions for a couple of minutes. Wash with warm water and dry the area. Repeat the procedure regularly. Egg white, besides nourishing the skin because of the presence of vitamins and proteins in it, also removes excess oil and constricts the pores and makes acne smaller. Procedure – Mix the pulp of half avocado and one egg white till a smooth consistency. To this add 1 tsp of freshly squeezed lemon juice and apply on the affected area. Wash off with water after about 20 minutes and dry. Repeat procedure till you get results. For more effectiveness, add 1 tbs of oatmeal to the mixture. You could add 1 tsp of yogurt in place of lemon juice. Tea tree oil has potent fungus and microbe fighting properties that help in inhibiting infection as well as the secretion of oil from the sebaceous glands. Procedure – Thoroughly mix tea tree oil and avocado oil in the ration of 4:6 respectively. Wash face and apply mixture in gentle circular motions. Apply facial steam and wash face with a gentle cleanser and dry off the area. Repeat procedure regularly till results are achieved. Castor oil, besides having intrinsic properties of fighting bacteria and inhibiting inflammation, also has excellent skin cleansing properties. Procedure – Thoroughly mix castor oil and avocado in the ratio of 3:7 respectively. Before you apply the mixture, take a facial steam. Now apply the mixture to the acne affected area in gentle circular motions and keep it overnight. Next morning clean with a gentle facial cleanser. Repeat procedure regularly till results are achieved. This combination is very effective in getting rid of dirt and impurities from deep skin layers. The presence of yogurt and olive oil in the combination also exhibits a synergistic effect. Procedure – Separately mash the pulp of half an avocado and half a ripe banana. Add 2 tbs of yogurt and 1 tbs of olive oil in a bowl and thoroughly mix with the pulp of avocado and banana. Apply the mixture till it completely dries on the affected area. Wash off the mask with warm water followed by cold water to seal the skin pores. Repeat the procedure regularly till acne are removed. Coffee has natural exfoliating and invigorating properties and is very effective in treating acne on the face that is cystic in nature. Procedure – Mix the pulp of half an avocado with 3 tsp of fresh coffee. Apply on the affected area by gently scrubbing in circular motions. Leave for about 3 minutes then rinse with water. Repeat procedure regularly to get desired results. Tomato works wonders on the skin. It not only cleans the skin pores and prevents the secretion of excess oil but also helps to maintain an optimum pH level besides protecting against free radicals by its anti-oxidizing properties. Procedure – Thoroughly mix avocado and tomato pulp. Clean face for about 10 minutes by steaming before applying. Apply to the acne affected area and leave for about 40 minutes and then wash the application off with warm water. For best results, repeat procedure at two day intervals. The combination of this facial mask exhibits properties that fight against bacteria, fungus and free radicals besides gently nourishing the skin. Procedure – Thoroughly mix 2 tbs avocado pulp, 1 tbs of honey, a quarter tsp of powered cinnamon and optionally, 1 tsp of cocoa powder. Apply the mixture on the acne affected area on the face and neck. Take care to avoid the eyes. Leave for about half an hour and wash off. Repeat the procedure weekly for better results. This combination not only helps in moisturizing the skin without blocking the pores but also exhibits ant-bacterial and anti-oxidizing properties. Procedure – Mash the pulp of a quarter of an avocado to a smooth consistency. Add to this 1 tbs coconut oil half tsp of powdered nutmeg and mix thoroughly. Apply this mixture to the acne affected area and leave it on for about 15 minutes. Wash off and dry the area. Repeat the procedure thrice in a week. Alternately, you can utilize honey in place of powered nutmeg. Yogurt has a soothing affect on the skin. The enzymes present in it cleanse the skin and inhibits the excess secretion of oil from the sebaceous glands. Procedure – Thoroughly mix 4 tbs avocado pulp and 2 tsp plain yogurt. Apply the mixture on the acne affected area and leave for a long as practically possible. Wash off with warm water. Repeat the procedure thrice weekly. The 90 % of water content of cucumber keeps the skin hydrated and also helps in maintaining the oil balance of the skin. It also enables the treatment of acne by its caustic property and restores skin tone. Procedure – Mix 2 tbs of cucumber juice with the pulp of half an avocado. Apply the mixture to the acne affected area in gentle circular motions for a couple of minutes. Leave it on for 15 minutes and then wash off with warm water and dry the area. Repeat the procedure thrice weekly. The intrinsic property of apple cider vinegar regulates the secretion of oil from the sebaceous glands by maintaining proper pH levels. It also cleanses the skin of dirt and impurities and also free radicals and helps in inhibiting acne formation. 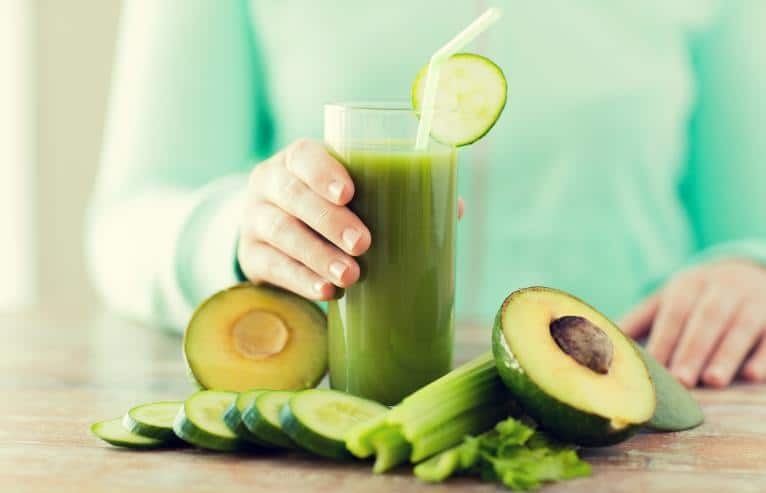 Procedure – Thoroughly mix pulp of half avocado, a quarter cup of raw oatmeal, 1 tsp of apple cider vinegar, 2 tsp honey and a couple of drops of lemon juice till it is a consistence paste. Apply on to the acne affected area and leave it for 25 minutes and then wash off with water. Repeat procedure thrice weekly. Is It Beneficial To Eat Avocado For Acne Treatment? Avocado is loaded with nutrients and when taken regularly, it helps in maintaining an optimal hormonal balance and internal lubrication of the skin. This is due to the presence of vitamins K, C, E and B5; folate; monounsaturated fats and potassium in it. Initially start with small quantities and then gradually build up to where you can add about half an avocado to your mixtures instead of bananas. You can even add avocado to your omelets or salads. Make sure you are not allergic to avocado. Do a skin test to ascertain this. It is always beneficial to steam your face before applying any of the methods as this will help in opening the pores and enable better absorption. Avocado stains clothes. So wear old outfits while applying any of the masks. A mask of avocado, banana and wheat gram will help get rid of acne by reducing skin pores. You can store excess avocado mask in an airtight container and keep it in the refrigerator up to three days. Drinking plenty of water during the day will help your skin remain hydrated and also help in getting rid of toxins. Besides the above, eating a balanced diet which include minerals, vitamins and iron will not only help in maintaining proper health but also ensure that your immune system is functioning optimally. And also remember, stress can be a trigger for acne outbursts, so leading a stress free lifestyle can be extremely beneficial in avoiding the formation of acne. Do keep in mind that even after using avocado alone or in any of the combination listed above you are still not able to get rid of your acne, then it is advisable that you go and consult a dermatologist. Otherwise with the right combination and regular use of avocado, you can very easily get rid of your acne by using any of the home remedies listed above.